WELCOME TO MY MONEY MISSION ONLINE: WONDERFUL WEDNESDAY MOM MINUTES AND MUCH, MUCH, MORE!! WONDERFUL WEDNESDAY MOM MINUTES AND MUCH, MUCH, MORE!! Yes, today is WEDNESDAY and that means, (drum roll please), MOM MINUTES! Every kitchen and bathroom should be fully stocked with an emergency clean-up kit. Have you ever had something messy happen (like milk spilling in a refrig....sorry, Mom, I just had to add that one! :)) and you have had to scurry and scrounge around for a rag, a cloth, a bucket, etc. Well, if you have a handy carry-all parked under your kitchen or bathroom sink, or on a shelf in your laundry or coat closet, then when the unexpected messy events happen, all you have to do is GRAB AND GO! Wet Wipes (these work great for little messes on counter tops, floors, doors, etc. Paper Towels - Bounty is best (did you know that individual rolls are best, because multi-rolls tend to be inferior. I read that somewhere, and it is true!! Next week, I'll be posting on organizing your medicine cabinet and readying your First Aid Kit for vacations and family outings. So, tune in next Wednesday for more "Mom Minutes!" Check here for the complete list! Now that it is definitely flea/tick season, these will come in very handy! Thank you, Brandie! Freebies 4 Mom: Arby's Free Chicken Club w/Drink Purchase.....Today is Wednesday, and that means that *some* Arby's are doing their summer promos. Call first to see if yours is participating! Big Thanks to Heather at freebies4mom for the link. Oh Alisa, isn't our mother just so funny. I can actually hear her saying that. I use one of those in each of the bathrooms so when I tell Angela and Michelle to clean the bathrooms, they can't give me any excuse that they can't find the cleaning supplies. Way to have a positive attitude Mom. I do things like that often, don't know if I would be so positive. You are so clever. I love that little caddy! 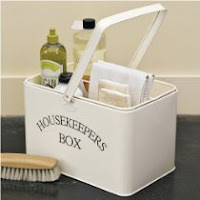 I LOVE your tips for the "housekeepers box" too cute. I just kinda throw it all under the kitchen sink, you've inspired me to organize it this week, thanks! And thanks for stopping by The Frugal Find! Yep, organization just doesn't seem to come natural for me. Thanks, Mom! You may have actually inspired me! I recently read somewhere that using a carpenter's type apron to carry things when you are cleaning cuts down on the time going back and forth for cleaners, rags, etc. I may try that one too. Helene, my mom loves a good tip, and she likes the carpenter's apron idea. She said that this would be much better than those flimsy aprons (with the teeny pocket) that she used to wear! Mom always has the best ideas. I was thinking(hard to believe) that maybe saving some type of cleaning samples for car would be a good idea. Like cleaning on the fly! I love mom and you A.Marie! I love the Mom minute tip, I never knew that till now hehehe.. will do that for sure.. I just noticed that I wasn't following you yet, I thought I was hehehe but i do now.